I published this in Rooflines on August 13, 2013 (also below). A year earlier I had published a piece in the Hindustan Times which was a view on Indian slums and housing policy from the United States. In this piece I invert the view and look at American community development policy from the perspective of Mumbai. The slums in Mumbai are not like slums in the United States. What typically characterizes a slum in the US—vacant, blighted property and lack of economic activity—is not true for India. The slums are often a hub of activity, with the ability to build onto homes to accommodate growing families and food and retail stalls to serve the needs of the community. Unfortunately, these slums, or so-called “wiki-cities” that I described—integrated, walkable, centrally-located communities that managed to aid not just survival but mobility in Mumbai—are slated for destruction. To its credit, Maharashtra State, the government of the state that includes Mumbai, passed a slum redevelopment law that many interpret to be a huge land grab. On the other hand, the law provides for housing to be built in situ for slum residents that can demonstrate long tenure in the area. Given the value of these locations and the fact that slum residents are basically squatters, this is a considerable recognition of slum-dwellers’ rights (though the law does not always work as designed and developers are frequently favored by the courts). Despite these advantages, the future for these slums is on display in Mankhurd and Sangharsh Nagarm. 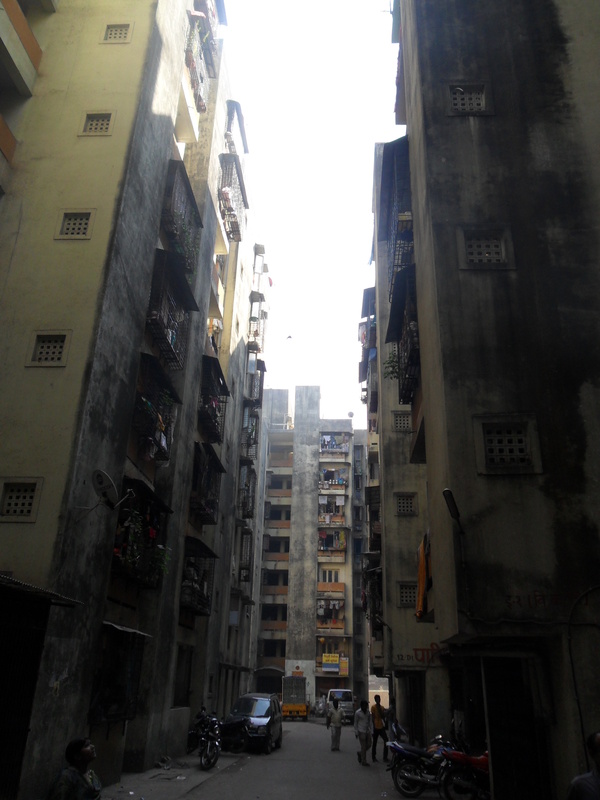 These are massive housing developments in Mumbai with tens of thousands of people. They are composed of large apartment blocks, seven to 10 stories high, containing 200-square-foot flats. They have elevators, indoor plumbing and electricity. They are also disconnected from the networks, economic activity, and communities that exist in slums like Dharavi. In part this is because they are not covered by the Slum Rehabilitation Act. Their slums were in places where they could not be redeveloped in situ, namely railroad tracks and a national park. However, the more salient fact is that organic, self-organized communities have been replaced by the efficient and abstract solution to housing lots of people: large apartment blocks. And indeed, the problem of housing Mumbai’s poor is one that invites thinking on a large scale. But the developments are not simply thoughtless beyond this basic consideration. Both Mankhurd and Sangharsh Nagar are designed in a manner that recognizes that apartments alone do not solve all problems. Ground floors are committed to spaces meant to accommodate economic activity. There is space between buildings for residents to commit to their own uses such as the construction of temples or spaces for children to play. And they are meant to solve many of the infrastructural problems of the slum—something that is easy to do in purpose-built, bureaucratically-approved, professionally-designed apartment blocks. The reaction of residents to life in these developments vary and require a bit of contextualization. First, the occupants did not come from relatively well-functioning slums like Dharavi, they came from much more marginal slums that have not benefitted from decades of investment and improvement. Advocates note that one can hardly scoff at the idea of suddenly being the owner of a flat when a few years before they were not owners of anything and were not recognized as legitimate residents of the city. Living next to, or on, a railroad track (Mankhurd) has its disadvantages, after all. And whatever the positive aesthetics of living in a national park are for those now in Sangharsh Nagar, the prospect of having a child carried off by a leopard is hardly appealing (yes, interview respondents reported this as a problem). The flats have indoor toilets—a huge advantage in a city where coping with bodily functions is an ongoing challenge. It is easier to secure property in an apartment than in many slum dwellings. Finally, there is the issue of status. Living in a flat in the city is a marker of status and is a significant aspiration for many, somewhat equivalent to the idea of owning a home for America’s poor. Slum lanes have real-estate brokers hawking flats that represent “modern living” in suburbs a couple of hours away. On the other hand, there are numerous problems. “Stakeholding” is not one of them as an American community developer might assume. The flats are owner occupied. One common complaint is that flats are not flexible—they cannot be adapted to shifting family size and economic needs (nuclear families do not share this complaint). An obvious problem is trash. It is everywhere. These developments are in the middle of nowhere and disconnected from the ragpickers’ circuit. Though high-value items are still repurposed: infrastructure is often scavenged for metal, accelerating the deterioration of the development. They might have indoor plumbing, but in the absence of water (water is often available for less than an hour per day) indoor plumbing is more of a curse than an advantage. Elevators break down regularly, effectively trapping people in upper apartments. Hallways are badly lit. The lack of economic opportunity is notable and simply having ground floor space committed to it does not recreate complex networks, markets, and material flows. This has immediate effects on the developments as streets become less safe and petty property crime becomes far more commonplace. The developments are problematic enough that at least some residents have chosen to take their chances with the leopards and move back to the national park. There is a strip in Mankhurd that looks as vibrant as slums like Dharavi. It is a lane between the railway station and the buildings themselves. Here there are lots of people who gather to purchase fresh food from the many vendors. There are children playing and adults socializing. The fact that this activity occurs at the boundary of Mankhurd, not internal to it, should not surprise us. As Dharavi is redeveloped the residents will have a couple of advantages over the residents of Mankhurd and Sangharsh Nagar. Most importantly, they will not be expelled to the periphery of the city. Mumbai is huge and the poor rely on a severely overtaxed railway system for mobility. They will also have title to a flat and have their residency situation legalized. Unfortunately, their communities will be turned upside down and, in the process, their round peg wiki-cities will be crammed into the square-holes imagined by developers and bureaucrats. Of course, most will adapt, but that does not mean that nothing is lost in the transition. Aside from the potential cost to the quality of life of slum residents and the loss of opportunities for social mobility, the round peg contains possibilities that will never be imagined by the square hole. ← detroit: exception or rule?